Crooked, yes. Jaded, no. : After rejecting the strict formalism of latter-day bluegrass, the Crooked Jades were told to go stand in the parking lot and think about what they'd done. Don't call it a comeback. The old-time folk music revival has been going on for years, despite its recent rise to prominence. While it's easy to point to the O Brother, Where Art Thou? soundtrack or the appearance of Old Crow Medicine Show on Entertainment Tonight and MTV2 as convenient signposts of this resurgence, the movement has been building on a grassroots level for much longer. Few know this better than singer and guitarist Jeff Kazor, whose band the Crooked Jades has been mining the old-time sounds of yore for the past decade. The San Francisco band has been starting modern-day barn dances among bluegrass faithful and hipster kids since the days when music critics were insisting that a DJ with a sampler and sequencer would render live musicians obsolete. Well, here we are 10 years later, and it seems like we're just as likely to see kids dancing around to a banjo and standup bass as to a techno beat. Kazor sees this irony as somewhat revealing. "It's interesting to see younger people jumping on the wagon," he says. "I think people feel that technology is taking over, and they are getting back to their roots. It's more of a backlash to techno music. ... A lot of younger folks have gone the other direction." The band is not made up of mere dilettantes, folks from the big city aiming to deconstruct and dilute traditional folk music to pander to a younger generation or hip marketing niche. Kazor and the rest of the Crooked Jades--Jennie Benford (mandolin/guitar/vocals), Adam Tanner (fiddle/vocals), Erik Pearson (banjos/slide guitar/vocals) and Megan Adie (bass/vocals)--have earned their folk music credentials through hard work and reverence for the forms they emulate, and they have the musical chops to back it up. Listening to his father's old-time folk and bluegrass records as a child growing up in Santa Cruz in the late '70s, Kazor developed a strong passion for American folk music traditions dating back to the 1800s. In fact, the entire band has an obsession with early folk recordings. "We listen to a lot of vintage vinyl, and pick a lot up from that," Kazor says. Through their encyclopedic knowledge of the music of their forbears, their attendance at old-time folk music camps and sheer will, Kazor feels that the Crooked Jades are respecting the music of their past in a way that preserves the music and passes it on to future generations. "I've gone to a lot of old-time camps dedicated to the preservation of the music and the passing of it on to other generations." Kazor credits this immersion in the musical traditions with making him comfortable to play the same role for future generations of musicians and listeners. Far from being strict revivalists, the Crooked Jades are careful to walk the fine line between being respectful of the traditions and making their music new and relevant in the year 2006. "I feel there is a balance there, a respect for the old-time music, while we also bring our own influence in," he says. The band do not simply wish to create a pastiche of a time or musical style long gone, it wants to make its music vital and relevant, in turn keeping the true spirit of old-time folk alive. "People want the form frozen in time, but when you do that it becomes stagnant. We want to make it a vital force in the year 2006," says Kazor. "We're artists sensitive to the world and the environment, and it's impossible to stay in a bubble to what's going on in the world." To this end, the band aims for an eclecticism in its music that has been largely forgotten by the strict bluegrass traditionalists and old-time revivalists. 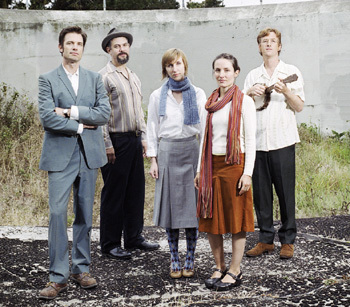 Kazor points back to the original world music folk forms that influenced the development of old-time music, and aims to reconnect it to European and African traditions that disappeared from the form as it cemented itself into the very strict formalism of bluegrass. "Some people may feel that there is too much of an edge to the Crooked Jades. ... We're really into restoring all that lost music. It seems bluegrass straightened it out and made it more accessible," Kazor explains. "The band is really all about restoring what has been lost." The Crooked Jades perform with the Hunger Mountain Boys on Thursday, Feb. 2, at 8pm at the Attic, 931 Pacific Ave., Santa Cruz. Tickets are $10; 831.460.1800. From the January 25-February 1, 2006 issue of Metro Santa Cruz.